If your have diabeties, there is something you should know about your eyes. 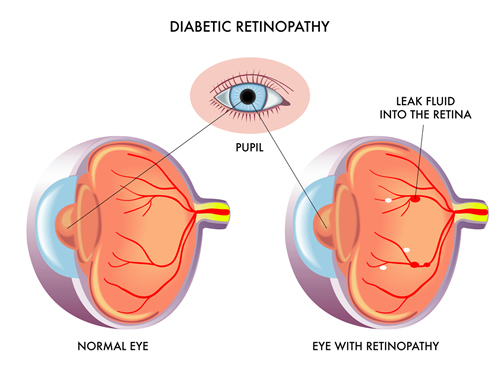 Diabetic retinopathy is a disease affects diabetic people and eventually leads to distorted, blurry vision and blindness. People who suffer with diabetes may often have unstable glucose levels and are prone to circulation problems in the back of the eye. There is a layer of tissue that lines the back of the eye and this is known as the Retina. The retina is a very sensitive part of the eye that is responsible for interpreting the images that you see and then transmitting these images to the brain. If someone is diabetic, they may experience a restriction of blood flow through the vessels within the retina. When bloodflow is restricted, swelling, bleeding, and even hemorrhaging may occur. Sometimes fluid can collect under the Retina and this problem is known as macular edema. Many diabetic patients can have diabetic retinopathy without knowing it. Usually, there is no pain and no outward sign. Over time, you may notice gradual blurring or some vision loss. Symptoms may come and go. If diabetic retinopathy is severe, you may have clouded vision or blindness. You should have regular eye exams to help your doctor detect changes in your eyes before your vision is damaged. Treatment may help slow the progress of diabetic retinopathy and sometimes can restore lost vision. Your treatment depends on your condition, but may include frequent exams to monitor your condition, laser treatment, surgery or other procedures. To learn more about Diabetic Eye Care, click on the video animations below.